Moving North from Latin America’s deep south we encounter Brazil and Colombia: our next stops on this journey. Near the Atlantic Coast we find Sao Paulo, one of Brazil’s biggest cities. Here, the Brazil Nihon Kiin was founded 30 years ago by Iwamoto Kaoru 9p, setting a pivot point for the development of Brazilian Go. Nowadays the Kiin receives around 20 players every day from all range of levels. It also holds a traditional handicap tournament on the 1st and 3rd Sunday of each month. Since 10 years ago they annually celebrate the Copa do Brazil, the official Brazilian Championship which gathers on average slightly more than 50 players. Nonetheless, this year Copa do Brazil will not take place, as Sao Paolo will be the host city of the 3rd Latin American Go Congress. The Congress includes the 21st Ibero American Go Championship, whose best Brazilian player will be crowned Brazilian champion. The Kiin also has a plan of running other tournaments following the Copa do Brazil model, and so far they’ve organized the Iwamoto Cup earlier this year with over 30 participants. On the youth arena, since 2016 Brazil Nihon Kiin has been working with the Sao Paulo City Prefecture in a project to include go in schools, preparing teachers of São Paulo municipal schools to be instructors of the game in the over 1,000 public schools in the city. At the time of writing, nearly 500 teachers and over 4,000 children have been initiated to the game. The biggest challange this project faces is the difficulty for schools to adquire go material to use in the go lessons. Besides this, Youth Championships have been held over the last few years, with different levels of attendance, ranging from 20 to 70 players. In the country’s provinces, most of the capitals have small go clubs or group meetings on a weekly basis, esspecially those where the Japanese community is more present. 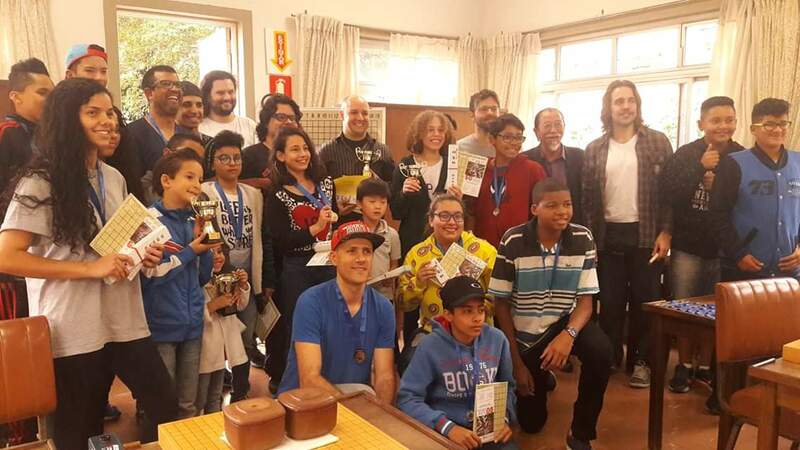 The Brazilian Go community has been very active online, mostly via the efforts of the OGS’s Go Brasil group admins, constantly organizing both live and correspondence tournaments. You can follow more of Brazil’s go activities on their Facebook page. From Sao Paulo we head northwest across the enigmatic Amazon rainforest to arrive in Colombia. Before 2016, Colombian Go was largely disorganised, and while there were some weekly meetings where players studied English go material and professional games together, there was no single agent pushing to promote or spread the game. It was at the beginning of 2016 that a group of players came up with the idea of organizing a national tournament, which eventually led to the constitution of the Colombian Go Association. Before long, an annual tournament calendar was fixed. This calendar includes 3 national tournaments, 2 extended handicap tournaments lasting 16 weeks each, 2 one-day tournaments and a one-day handicap championship. If we add to this list the Latin American Team Championship on the Pandanet go server and the Latin American Go Congress, we realise that Colombian go players are extremely active nowadays. The activation of this calendar produced a new wave of beginners which have now improved their game level. It has also motivated a new interest for studying the game among the most experienced players. 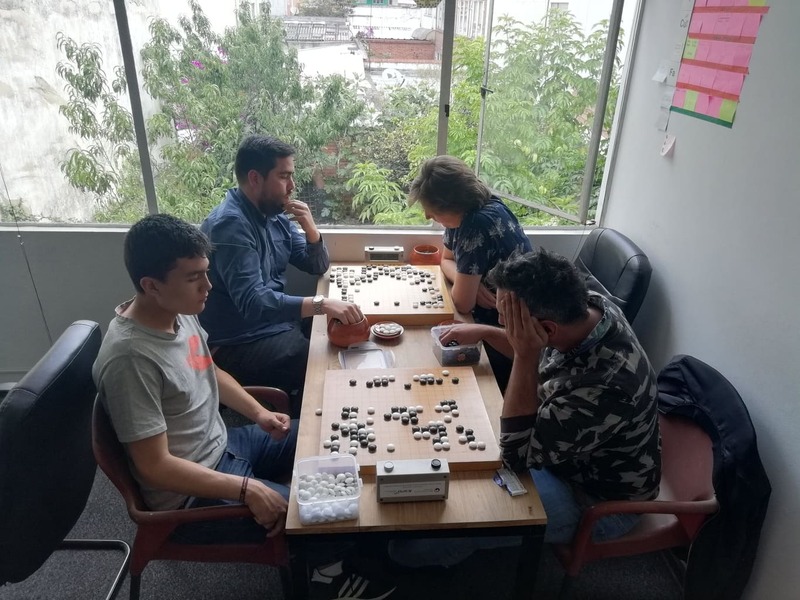 Even some of the first-generation players have restarted their participation in tournaments and are promoting the development of the whole Colombian go community. Besides the tournaments, some players work as go teachers and thanks to this they have achieved a slow but steady progress in the recruiting of new players. In addition they’ve started producing go stones and boards, which has helped reach other cities inside the country and has allowed the creation of small playing groups that meet with relative frequency. Colombian Go Association is well aware of the challenges of the epoch. The most important goal they identify is amassing players on a national scale. Nowadays their database gathers around 40 players from 10 kyu to 5 dan, but the problem is that almost all of them belong to the same generation, averaging at more than 30 years of age, which means that it’s urgent for them to promote the game among the younger generations as a short and mid-term goal. They realize that in countries where go is developing, the level of players forms a pyramid shape with a lot of inexperienced players, an adequate number of mid-level players and a small number of experienced players. We wish the best luck to Colombia in their efforts towards the future! You can follow the progress of the Colombian Go Association on their Facebook page. We have now gotten all the way from Punta Arenas at the bottom of the continent up to Bogota, and in the next episode we will be visiting the Caribbean sea. Stay tuned for more surprises on this journey! Thanks to Felipe Herman van Riemsdijk and Felipe Moreno for providing information for this article.